But that doesn't stop the middle class from pointing fingers. Reporter Tracie McMillan has spent a lot of time analyzing what Americans really do with their food - how they get it, and where it goes. And she has come to some interesting, and occasionally counter-intuitive results. If you have ever been poor, these results are unsurprising. 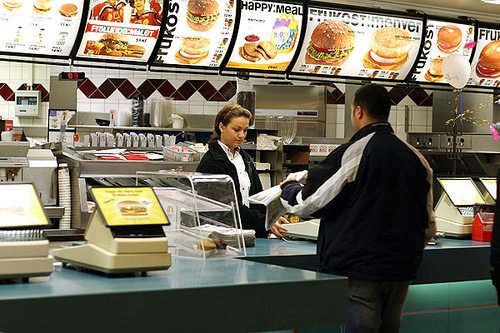 A meal at McDonald's costs between $3-7 per person, and that's a lot of money if you are making minimum wage. Most people under the poverty level are aiming for a per-meal cost of $1 per person or less, and that includes SNAP funds. Basically what we have is a situation where the middle class eats at McDonald's, pretends that it doesn't, and blames the poor for being fat because they eat at McDonald's. I suppose you can chalk it up to that old adage that "we hate most in others what we hate about ourselves." Poverty doesn't mean eating at McDonald's. When I was a kid, my mother and I were poor, and McDonald's was a treat on par with "where we go for someone's birthday," not a weekday meal. Poverty means rice for dinner every night, with a different bag of frozen vegetables microwaved and mixed in. Poverty means buying one of the cheap loaves of store brand bread, the kind that are about three inches high and two feet long, and using the entire thing to make peanut butter and jelly sandwiches for the week. (Peanut butter may be expensive, but it's also a common item at food banks.) Poverty does not mean Big Macs.